It seems as if the whole country is preparing for the celestial event happening on August 21st. Is your family or classroom thinking about observing the upcoming solar eclipse? It's being described as the "Great American Eclipse" since it will be visible in totality only within a band across the entire contiguous United States. Everyone in the country will be able to see at least a partial eclipse, but only those within the path of totality will see the full eclipse. 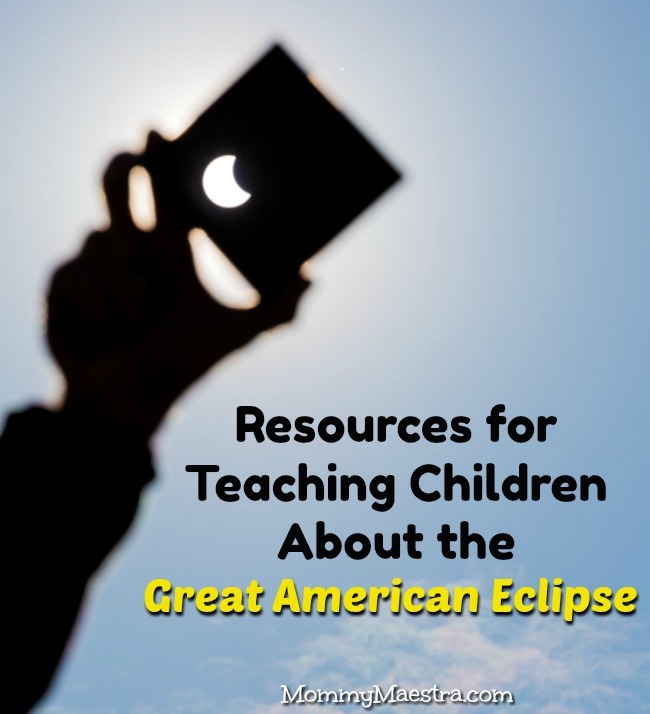 This is a wonderful opportunity for children across the country to learn about eclipses and especially about the sun and its corona. If you are looking for resources to help you teach your students or children about this event, I've compiled a list of some excellent sites and tools that you can use. NASA Total Eclipse website - This is seriously my favorite resource! From activities to lesson plans to citizen science, NASA has compiled EVERYTHING you need to study and prepare for not only the Great American Eclipse but any eclipse. You can even live stream the event safely from your computer - so if you aren't in the path of totality, you can still view the complete solar eclipse. They also have a section created specifically for HOMESCHOOLERS with family activities and free downloads. PBS Learning Media has also put together a bunch of resources for educators and students to learn about eclipses. This page is a compilation of materials you can use to accompany their Teacher Toolkit. BrainPOP Educators - A short list of their eclipse resources. Remember! NEVER look at the sun directly - even during an eclipse! Use solar eclipse viewing glasses to protect your eyes. Here are some possible glasses available via Amazon. But remember to order them soon as there is no guarantee there will be any available in the weeks leading up to the eclipse! Total Solar Eclipse - Available for iOS and Android; Gives you access to five simultaneous video streams, including live coverage in Spanish hosted by Exploratorium educators.